The Shield GI/WPG Nylon Warm Plate Gloves are high-quality nylon gloves with rubber dots on the palm for secure grip and protection against contact heat. 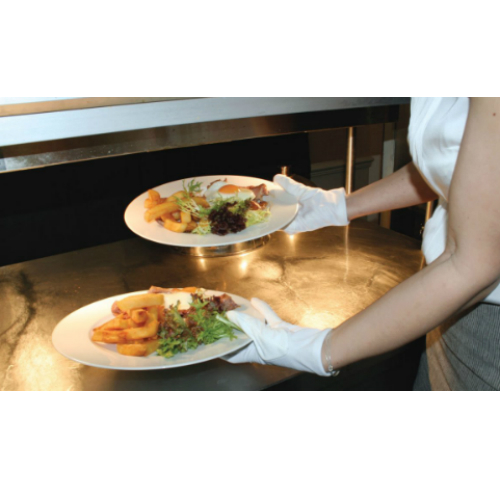 These comfortable gloves are intended for use by wait-staff in the culinary industry and can be washed and reused multiple times, providing maximum value-for-money. The GI/WPG Gloves are made entirely from nylon, which gives them both strength and stretch for protection with a snug fit. Lightweight and flexible, these gloves are designed to remain comfortable during extended periods of wear. Rubber dots on the under side and a reinforced palm and thumb provide superior grip and added protection. The GI/WPG Gloves are white in colour, which makes them inconspicuous and visually-appealing for use in a wide range of culinary environments. Machine-washable, these gloves are easy to clean and can be reused multiple times without fear of compromising hygiene. The Shield GI/WPG Gloves are available in one universal size that is designed to fit most users. This size has a length of 220mm (± 10 mm) and a thickness of 190gsm.